I often will scan through topics on brass fora for blogging ideas. This particular question was asked on the Trumpet Herald Forum. So for some time now my I have had decreased range and endurance. I think it is due to a weak upper lip. When I get about a G above the staff my emborchure changes and goes from a 1 third top, 2 thirds bottom to a 1 fourth top, 3 fourths bottom. Is there a way to just strength my upper lip? Here, then, is my slightly edited response in that topic. My short advice is to place the mouthpiece where you put it for the high range and learn to play your entire range there. It may take some weeks of practice before you start becoming comfortable enough to play that way always, but you’ll probably be better off in the long term. If you want to understand why I feel this way, read on. When I get about a G above the staff my emborchure changes and goes from a 1 third top, 2 thirds bottom to a 1 fourth top, 3 fourths bottom. Since I have not watched you play in person, you should take my advice with a grain of salt. That said, based on your description you have a “low placement” upstream embouchure type. It’s neither good nor bad, it’s sort of like being left handed. It’s less common than the downstream embouchure types, so you’ll see fewer players around using it. It also is different from the other embouchure types and certain instructions you might get that work great for downstream players actually work against low placement players. I’ve taught many upstream players and happen to be one myself. Your switch in mouthpiece placement at a certain point in your range is actually a pretty common upstream problem. Again, without watching you play I can’t be certain if this applies to you or not, but almost every time I’ve seen this (and experienced it in my own playing at one time) the solution is not to try to keep your low register placement for the high register, it’s to learn to play your entire range with the high register placement. And this placement has been without exception, for these players, a placement with more lower lip inside the mouthpiece (placement closer to the chin). Something that helped me and many of my students with similar issues is to place the mouthpiece on your lips where it works best for the high range, play an open note in your high range, and slowly and softly slur down a partial and back up, then back down two partials and up, down three and up, etc. Accept a thinner sound for the moment, just learn what your chops need to do in order to descend with the high register setting. Avoid dropping your jaw as much as possible for this and don’t worry if you can’t get much lower than where you want to reset. 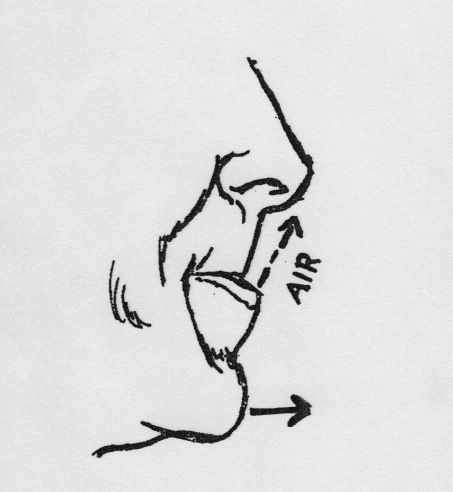 If you watch yourself in a mirror while doing this you might be able to notice that you’re pushing your lips and mouthpiece together upward towards the nose as you descend. This is natural and proper for upstream players (the downstream embouchures can either do the same or reverse, depending on type). The track of this “embouchure motion” of up to descend and down to ascend can be close to straight up and down, or it can be angled, but it should probably be a straight line and consistently work in the same direction (i.e., up and slightly to the right to descend, down and slightly to the left to ascend). If you find yourself needing to reverse the direction of this you might be going too far with it. Along with good breathing and proper tongue arch to change registers, finding the exact spot for your embouchure motion for each pitch is going to help you open up your sound and keep your mouthpiece placement consistent for your entire register. A good analogy is that your chops are, for now, like a muscle car. The engine sounds pretty rough when you’re idling at the stop light, but once your up to highway speed it’s very smooth. Once you can “tune up” your playing mechanics to adjust you’re “engine” will work fine in all registers. Again, all the above makes certain assumptions based only one what you’ve written here already, and I could be way off base. I also want to mention that much of what I wrote would be wrong for most other players, so for any folks who disagree, please put my advice in that context. I’m trying to get through some of the questions I’ve been emailed that have piled up. This one is from Mark. Anyway, since we free buzz downstream, how can we tell about the accuracy of our true buzz, as downstreamers do? Also, as I am on the somewhat smaller side, is smaller equip. more in resonance with me as as a player, or is that irrelevant? In case you surfed over here and haven’t seen how I personally will use the terms “upstream” and “downstream” in relationship to embouchure, you will want to take a bit on look through this resource here. Both Mark and I are not talking about whether you have a high or low horn angle, we’re talking about how the air stream actually passes the lips into the mouthpiece. Mark mentions that upstream players will (should) free buzz downstream when practicing free buzzing exercises. This is because it is the best way for brass players to target the specific muscles you want to focus on with your brass embouchure (the intersection of muscles at and just under the mouth corners). Trying to make your free buzz work upstream, even if you’re naturally an upstream player, typically forces your lips into a position where you’re not really targeting the correct muscles. Here is another resource I have put together on free buzzing. To get to Mark’s question about the accuracy of the buzz I think it’s important to note that I don’t consider free buzzing to be a useful diagnostic tool, but rather a type of practice that one can use. 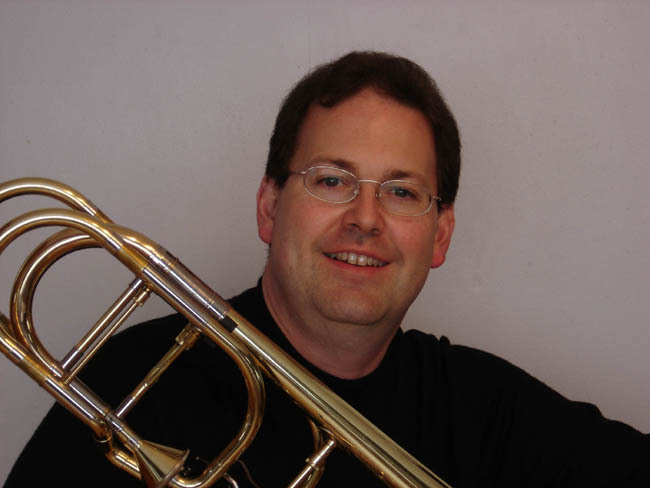 While it may be true that many downstream players want to make their playing embouchure more like their free buzzing embouchure, that’s not always the case. For some players of any embouchure type you can see the aperture forming in one spot with free buzzing, but if you look inside a transparent mouthpiece or visualizer you’ll see the aperture forming in a a different spot on the lips (here’s a resource I’ve put together on this topic). Incidentally, I do not use a rim cut-a-away/visualizer as a diagnostic tool either, but prefer a transparent mouthpiece as it shows us the most accurate look at a player’s embouchure as it actually is functioning while performing. If you want to see what any player’s embouchure is actually doing when playing you shouldn’t rely on free buzzing or rim only buzzing. It might be similar, but it might be completely different. Brass teachers and players who rely exclusively on those methods for embouchure diagnosis are getting an incomplete picture. Regarding Mark’s equipment question, I have to start off by warning everyone that I really haven’t looked very closely at this. Most of my mouthpiece recommendations are based on what I learned from Doug Elliott in some of my lessons with him. We’ve mostly discussed how different embouchure types can respond to different general mouthpiece features. It seems logical that for a very small person a smaller mouthpiece might be typical and larger folks might want to play on a generally larger mouthpiece. That said, I don’t really know how accurate this idea is. One thing that I really like about the equipment recommendations I got from Doug is that he started from a general recommendation and then methodically helps you find the right mouthpiece for you. In one of my lessons he brought out different sized rims and had me try them out one at a time, going to the next larger size each time. As I went bigger we both noticed slight improvements in my sound up to a point at which the next larger rim size made my sound less focused. Going back to one size smaller ended up being perfect for me. If you’re looking to work out a good mouthpiece size for your personal embouchure I’d recommend a similar experiment. Try out mouthpieces that change one feature (cup size, cup shape, rim size, rim bite, etc.) and methodically try them out until you find the best fit for you. It may be more difficult to get a hold of all those different mouthpieces, but I think this may be the best way to really know for sure. I’ve got a whole bunch of questions from a while ago piling up and I wanted to try to get some of them answered as best as I can. Part of the reason it takes me so long to respond to these is that often times there’s no way I can offer any advice without being able to watch the player in person. That said, I can sometimes make some general suggestions that might be helpful, or at least clear up some confusion. Here is one I got last month. Hello, I have watch almost every single one of your videos posted on youtube about upstream embouchure as I have one. I have even commented to ask you once but there wasn’t a reply from you so I gave up on asking you but I somehow came to this site still wondering if my embouchure is right and am somehow writing an email to you haha. Anyways, my embouchure is an upstream embouchure as I said before but when I blow the air without a mouthpiece, the air goes downward. I have tried playing with a downstream embouchure but it pretty much doesn’t work for me. So I kept playing with a upstream embouchure but now that I am trying to play high notes on a trumpet like G, A, B, and high C, the sound barely comes out. People say it has to do with practices but I practice A LOT. First of all, I can’t assume that you’ve got an upstream embouchure without being able to watch you play, so yes, if you can send a video for me to watch that might be helpful. Sometimes folks misunderstand what it means to have an upstream embouchure (“low placement” embouchure type), because there is a very common misconception that playing with an upstream embouchure means playing with a high horn angle. 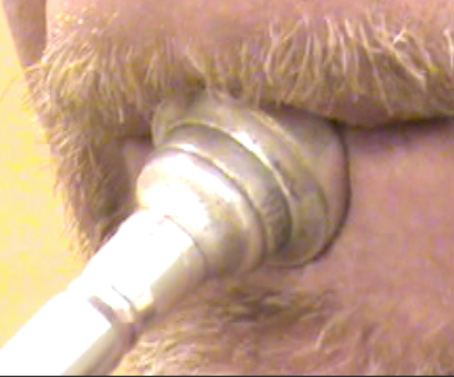 An upstream embouchure is dependent on a mouthpiece placement that has more lower lip inside the mouthpiece, not a high horn angle. Perhaps you do grasp this important point and are playing with an upstream embouchure, but this doesn’t necessarily mean you should be playing this way, or perhaps you are doing something incorrect in your playing that is causing your problems. Without watching you play, it’s hard to say. Secondly, because an upstream embouchure depends on the mouthpiece placement, there’s really no correlation between how you play (or should be playing) and how you blow or buzz without a mouthpiece. In fact, I recommend that all players, regardless of embouchure type, free buzz with their lips set in a downstream position. This is helpful for strengthening the embouchure muscles in a safe and correct way, while contorting your lips into an upstream free buzz will probably work your embouchure in the wrong way. There is an exercise that Roy Stevens came up with that you might find helpful, the “air to nose exercise.” This was one of three away-from-the-horn exercises that Stevens covered in his book. In this exercise you roll your lips in to “hug the teeth edges,” then by bringing your jaw forward you blow air so that it strikes the tip of your nose. This approximates what happens inside the mouthpiece for an upstream player, particular those more common “low placement” embouchure type players who play with a protruded jaw position. As far as your difficulties playing above G go, I would really need to watch you play, preferably in person. There are many things that players can do that hinder their development in the upper register. For example, it’s very common for “low placement” type players to bring their mouth corners back into a smile while ascending, which limits their high range. Or it may be related to how your embouchure motion is working (or not working). It might also be related to something that you’re doing in a completely different register which might not be apparent at first. Do you have a question that you’d like to see me address here? Please feel free to contact me and ask away. I can’t promise that my response won’t be, “I’d have to see it,” but if I can answer generally I’ll try to give it a try. A discussion about my Playing in the Red Blindfold Test over on the Trumpet Herald Forum brought up Herbert Clarke. Looking through my copy of his Technical Studies I didn’t find any specific recommendations about mouthpiece placement, so I decided to poke around online and see if there was any advice attributed to Clarke about mouthpiece placement. While I wasn’t able to find anything specific, I did find something interesting that apparently was written in Clarke’s Series of Autobiographical Sketches. Clarke tells the story of how he went to a concert and heard a very fine cornet player solo. The number, an extremely difficult cornet solo which demanded great endurance in playing was the Excelsior Polka by Frewin (I later purchased a copy for cornet and piano). At the ending of the solo the young player was given an ovation of tumultuous applause, in which I joined vigorously. The cornetist again arose, but this time stepped to the front of the platform, and to my wonderment played the entire solo through for the second time without seeming tired or making a slip. The remarkable thing about his performance was that he played so easily, gracefully; apparently with unconcern, and without any facial muscular contortions or movements. His face did not become purple, distorted, or show any signs of strain. I always had made such hard work in playing even a simple little polka which did not reach G on the first space above, that to watch him play with such perfect ease a number which seemed filled with top “C’s” and then end it on the highest note, actually dumfounded me. It was both a revelation and an inspiration! After the close of the concert I inquired as to the players identity, and learned that he was a Walter B. Rogers who came from the little town of Delphi, in Indiana, I also found out that he played at the Opera House when the season was done. Later Clarke had the opportunity to watch Rogers perform up close and he noticed his mouthpiece placement. Clarke tried to imitate Rogers here but found it impossible for him. After the show was over I walked along to think about it, and finally determined to try to imitate this “wonder”. The next morning after breakfast I took my cornet to my room and commenced to experiment, but the more I blew the harder it became for me. Then I stood before the mirror and tried to adjust the mouthpiece to my lips the same as I had observed Rogers do the night before, placing just a little of it on the upper lip with more on the lower lip and drawing the latter in slightly over the teeth, but not a tone came out of the cornet! I tried it again and again with no better results, and then I did actually get mad. I kept up this experimenting all that day, and the following night bought another front seat ticket for the some show. On this night Rogers played a cornet solo between the acts, not standing up before the audience but remaining seated. The selection was Hartman’s Carnival of Venice, and well, perhaps I did not watch him as he played it! Based on Clarke’s description (bold emphasis is mine) it is probable that Rogers had an upstream (low placement type) embouchure. This embouchure type is less common than the downstream types, but is correct for a sizable minority of players. Many teachers recommend against this embouchure type based on their own experiences trying to play this way and failing. Downstream embouchure type players will almost always find playing with an upstream, low placement embouchure challenging, to say the least. Here’s what Clarke found when he tried it. The next morning I tried the same way of playing as on the previous day, only changing the position of the mouthpiece against my lips, and again struggled to produce tones. The only result being that I found myself worse off than before, and by the end of that week I could play neither in the old way nor in the new. This was so discouraging that I nearly arrived at a point of giving up the whole thing in disgust. Fortunately for me, however, I had been born with a goodly amount of perseverance and obstinacy in my makeup and stuck to the game although not without admitting to myself that if it was necessary to play the cornet in the old way and suffer with the some strains and headaches as before, perhaps it might be as well if not better to discard playing altogether. For some reason upstream players tend to do better playing downstream than downstream players incorrectly playing upstream. This seems to reinforce the idea that placing the mouthpiece so there’s more lower lip inside is wrong. However, for players with the anatomy that is suited for a low placement embouchure type this won’t work as well as sticking with the best placement for their face and learning to work with it. The moral of the story is that you should work with the mouthpiece placement that works best for you and learn to play your entire range that way. Trying to “fix” your chops by imitating someone with a different embouchure type can be destructive to your playing. Asking your students to adopt your own embouchure type because that’s how you happen to play isn’t always going to work either.